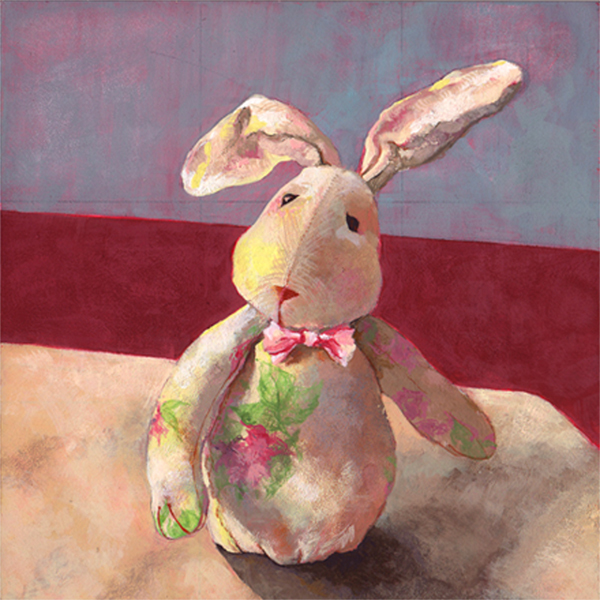 Sarah Alfarhan: Painting of Bunny! I've had 'Bunny' since sophomore year at Uarts. I've always kept her close to my work area, her 1st home -when I first got her- was on my desk at Juniper Street Dorm. Then she stood by the windowsill in my room at the cute house I lived in while attending Ringling in Sarasota (FL), after I came back to Philly she occupied the work area near the kitchen in my tiny studio on Spruce Street. 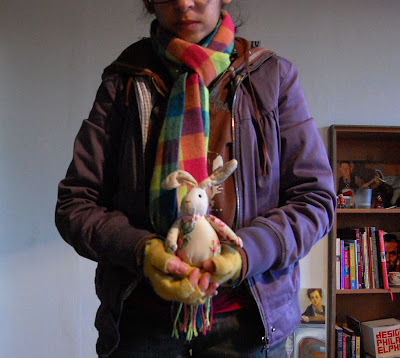 My last year at Uarts she moved with me & all my art supplies to the Senior Design Studio, after graduation when I went to Richmond for the Illustration Academy she accompanied me & stayed at my work table. While at the Illustration Academy my friend Michael Politakis started calling her 'Petunia'! 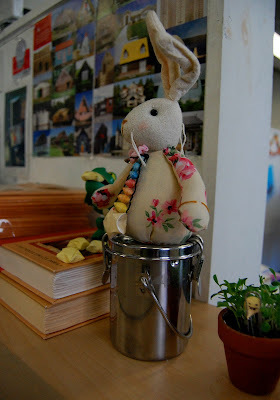 A picture of Bunny at my desk in the Senior Design Studio. Close by are two Lemony Snicket books + plant (can't recall what I was growing) + assignments folder. In the back is her new home, she now resides next to Doug Chayka's painting + Charles Valsechi's landscape painting + Henri Bendel Vanilla Woods candle (apparently they don't make that candle anymore ☹) + numerous books including Kadir Nelson's 'Abe's Honest Words' picture book + Brett Helquist's 'A Christmas Carol'! Painting of Bunny. Gouache on Ampersand GessoBord. 6" x 6". What do YOU keep close by while working? I love this Sarah! Really... And the colors are fabulous, as always. Oh my god, it's so much fun! It looks so soft, great light, great textures! I think you should do more still lives to just play with the paint. Really beautiful work. You're so good with colors! Thank you Sara + Natasha + Corrin! Katia: Thanks & that's my plan, more still life paintings!